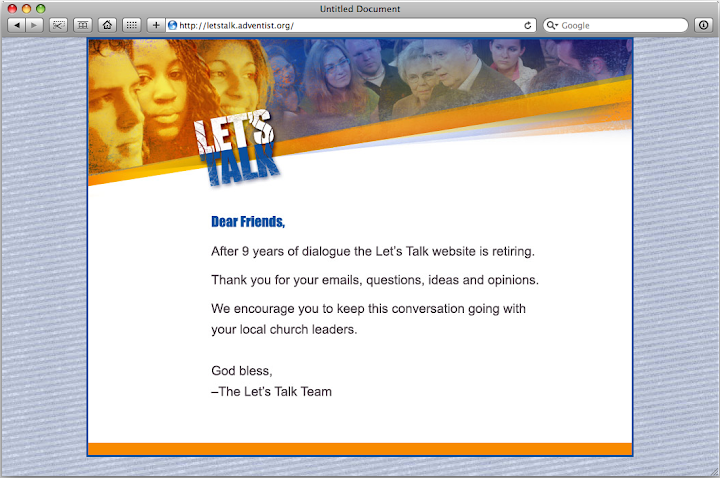 After 9 years, the Let’s Talk website, where youth and young adults could ask the Seventh-day Adventist Church president questions about the church, closes down. Let’s Talk was a televised series of dialogues between young people and former Adventist world church president Jan Paulsen. Update: We emailed the Adventist Church, asking why Let's Talk was cancelled. We haven't received a reply. This is too bad. I only recently heard about the Let's Talk series from a friend who had positive things to say about it. I hope that Elder Wilson will create his own way to communicate to the youth and young adults in our church as well. Why would they continue it? Wilson wants to take the church back a few decades and he'll get only criticism from the Let's Talk demographic. GYC 2010 - "No Turning Back"